"Hey John Nice to hear from you and thanks for the submission. I like what you've done with the track. It has a good feel and mood. Very interesting and cynical lyrics which are so 100% true! Keep me posted on new material. Ill be in touch when I have finalized all the artists I have chosen. Much Love Alex CMI Music Group"
"I May be a masochist in other regions, but I'm not that much of a masochist that I'm going to pay money to tear myself to bits----reading" Jimmy Page- On all the nasty critiques Led Zeppelin got in their early career. 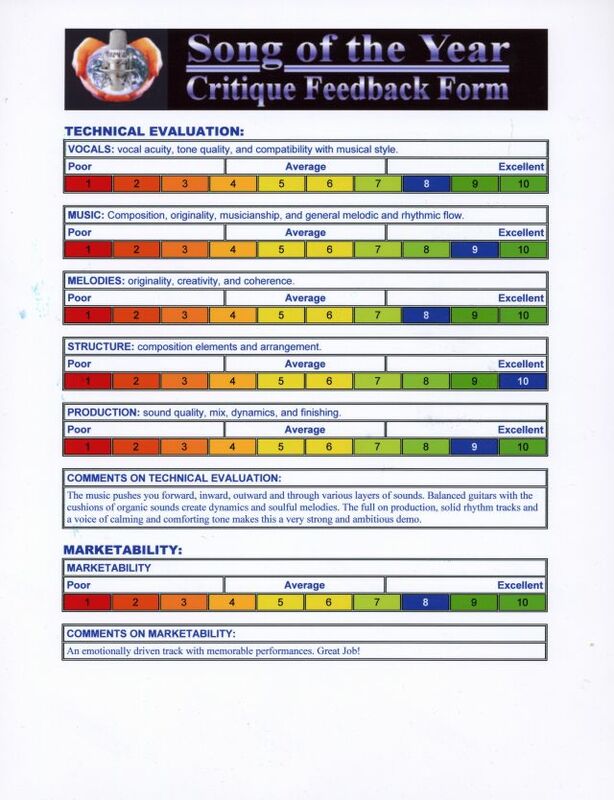 RATING SCALE "1" Indicates the Lowest Score "5" Indicates The Highest Score. 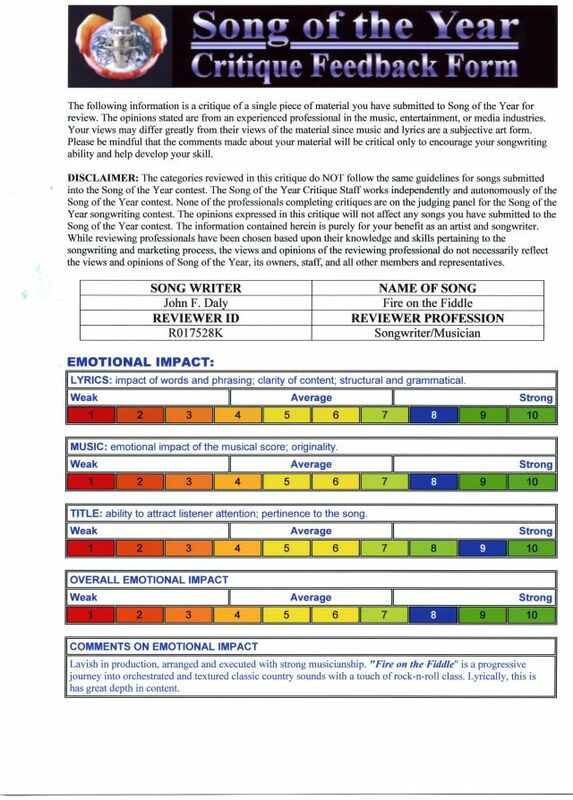 Recording Quality/Production: 4 Lead Vocals: 4 Musicianship: 4.5 Lyric Writing: 4 Music Composing: 4 Melodies: 5 Song Arrangement: 4 Quality of EPK Content: 4 Overall Delivery: 4 ----------------------------- Dear John, Thanks for submitting the material for the evaluation. I enjoyed the songs very much. Nice work on the writing and performance. The songs are well done and delivered with confidence and sincerity. Music is written from the heart and draws inspiration from personal feelings and life experiences. If an event has impacted a musician, they express it through the art they create. John Daly has done this very thing and created the bluesy “Don’t Drink the Bottle,” which we’re proud to bring to the Rock Band Network! John has been performing since he was young. Born in Levitttown, Pennsylvania, John played locally until he moved to Florida and began recording CDs with a studio band. A man of many talents, John has written many kinds of songs, from Big Band to Country, and is looking to have his music heard in as many places as possible. It’s only natural then that the Rock Band Network would be the next avenue for his music to show up in. “Don’t Drink the Bottle” is a song about John’s father, who succumbed to alcoholism when John was still young. It’s a perfect portrayal of alcoholism and how it affects not only the alcoholic but the people around him as well. This story is wrapped up in a blues-rock package with catchy guitar riffs and powerful vocals that showcase John’s musical talent. This man needs a meme. Antoine “Hide Yo Kids” Dodson was just a concerned citizen until AutoTune brought the LOLs. And Epic Beard Man was nothing more than an angry war vet until the mysterious Amber Lamps ignored him. Earnest musician John Daly has brought the hair, the strippers and the chroma key – what can you add? How do you style yourself for a music video? All depends what the subject matter is. I dressed up for Dazie because of the higher class strip clubs depicted in the video. Usually, the bouncers and the doormen are dressed formally. What is it about strip clubs that are so compelling? Well, first of all it’s very exciting for the male species to see half/full naked women dancing around, but I wanted to capture the women’s side of it also, which is needing money and what needs to be done to get it. How long have you been growing your hair for? I’ve had long hair since the late 90′s. Do you work with a team of people to make the clips? So far, no. It’s all me. How do you collect the video and stills for your music videos? I shoot most of the video myself. I have other people help out by letting me use their footage sometimes. I take most of the photos from my own collection and also by available Google search photos that depict what I’ve trying to convey in the story. What’s been the reaction to your music videos? I’m getting more and more good responses. It takes a lot of promoting to get them in front of decent size audiences. What are your favorite clips from other artists? I’ve always loved live classic rock footage. One I can think of right off the bat is Led Zeppelin’s performance of Kashmir at Earls Court in London 1975. I want to take this thing as far as God will let me. I love this business and want to do nothing else. http://worldtalentsradio.com/ 06/09/2010 On the top ten playlist -with the song "Starting Over"
mainstream current top 40 tracks). We are proud to have you in our line up and look forward to hearing more great music in the future. www.RRadioMusic.com letter/email notice: "Congratulations "Meagan won't ya make (me a drink)" unseated one of the previous top songs! Energy- We thought your track had rousing energy. You sound confident in your musical skills and the parts you're playing. We think your Rhythmic elements on this release can hang with the best of them. Tight clean and interesting playing. Hook: Ah, the elusive hook. A great hook can redeem a troubled song or get a payday for a topnotch band. Your hooks grabbed us. Excellent work! Crafting interesting lyrics is hard and a completely different art then writing the music. Clearly you've put some thought into your lyrics. Great work! We thought this song had a logical structure and all the parts were distinct. A good song structure generally has the repetition and surprise. And we thought you nailed it. MUSIC: Emotional impact of the musical score; originality. This is a fun kind of song with an anthemic "time for a comeback" vibe. The lyrics aren’t the most complex but work. The music has a heavy, gritty groove that has a good sound. The title carries a staunch message. LYRICAL DYNAMICS: Content flow, content clarity (how clear is the story, message or meaning). COMPOSITION: Instrumental arrangement, rhythm, tempo and creativity. PRODUCTION: Sound quality, mix, dynamics, and finishing. The musical performance has a steady, consistent quality and just grinds along as a solid rocker. The arrangement is clean and sharp with no frills. The following information is a critique of a single piece of material you have submitted to Song of the Year for review. The opinions stated are from an experienced professional in the music, entertainment, or media industries. Your views may differ greatly from their views of the material since music and lyrics are a subjective art form. Please be mindful that the comments made about your material will be critical only to encourage your songwriting ability and help develop your skill. LYRICS: Impact of words and phrasing; clarity of content; structural and grammatical. TITLE: Ability to attract listener attention; pertinence to the song. Emotional Commentary: I truly enjoyed this song. It tells a intriguing story while maintaining a little bit of humor in it as well. The emotions the character in the song is feeling is perfectly demonstrated by the title "Meagan Won't Ya Make Me A Drink" very nice job in capturing the image. VOCALS: Vocal acuity, tone quality, and compatibility with musical style. MUSIC: Composition, originality, musicianship, and general melodic and rhythmic flow. MELODIES: originality, creativity, and coherence. STRUCTURE: Composition elements and arrangement. Technical Commentary: Everything about this song worked entirely well together. The music choice, the melodies, and the structure was great. The sound was clear, the mix was fitting, making this songs overall production perfect. 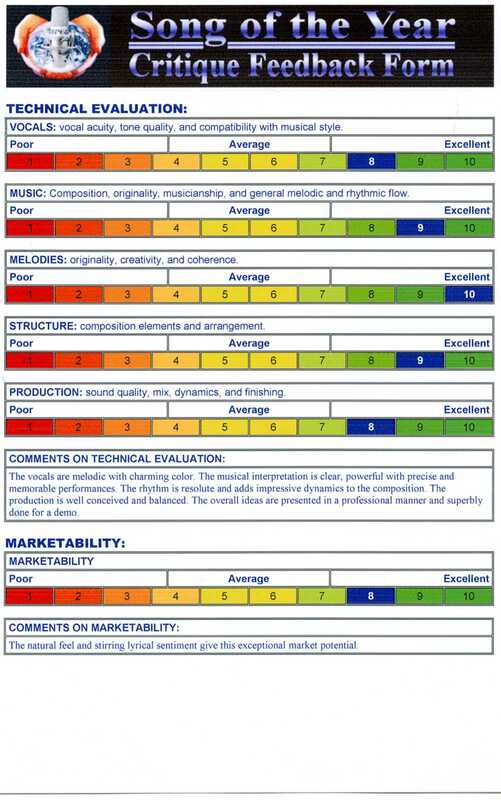 MARKETABILITY: Sound quality, mix, dynamics, and finishing. DISCLAIMER: The categories reviewed in this critique do NOT follow the same guidelines for songs submitted into the Song of the Year contest. The Song of the Year Critique Staff works independently and autonomously of the Song of the Year contest. 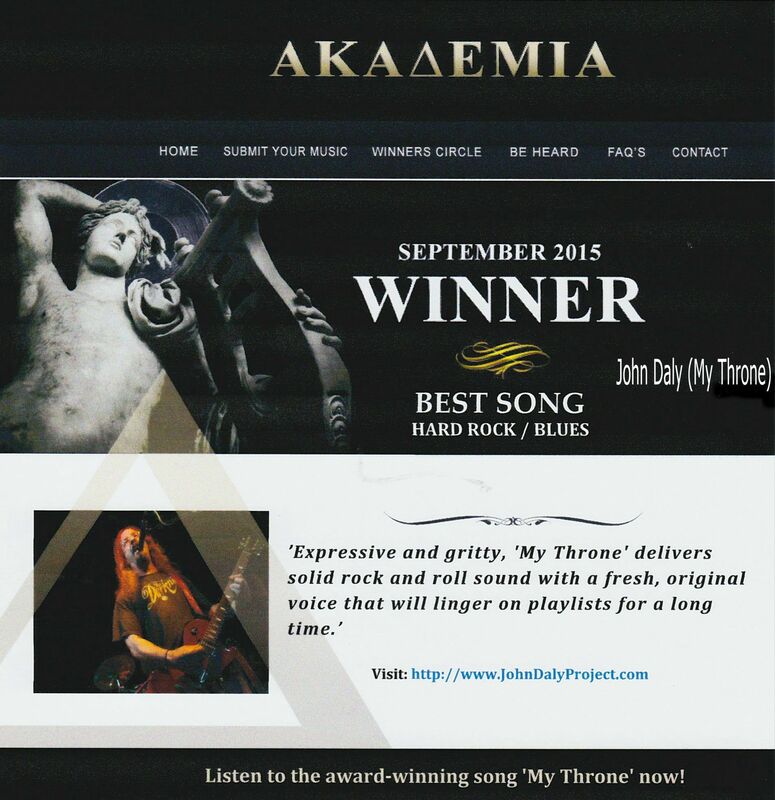 None of the professionals completing critiques are on the judging panel for the Song of the Year songwriting contest. The opinions expressed in this critique will not affect any songs you have submitted to the Song of the Year contest. The information contained herein is purely for your benefit as an artist and songwriter. 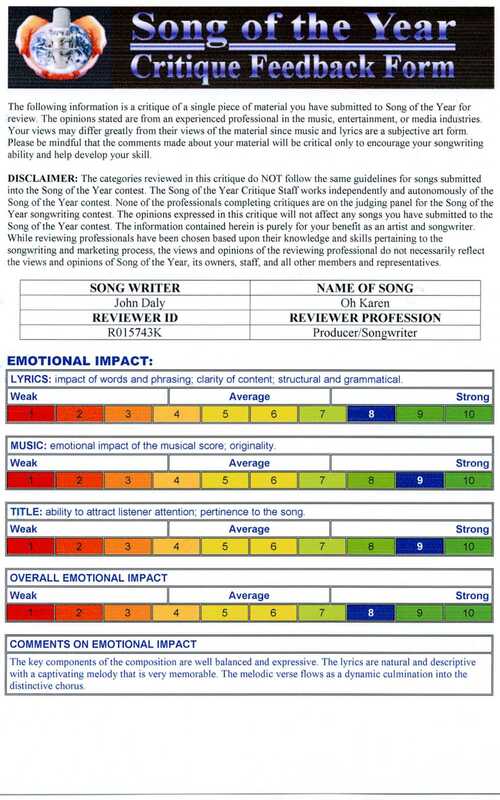 While reviewing professionals have been chosen based upon their knowledge and skills pertaining to the songwriting and marketing process, the views and opinions of the reviewing professional do not necessarily reflect the views and opinions of Song of the Year, its owners, staff, and all other members and representatives. If Daly's debut solo album sounds a tad famaliar to you, then you've been bar-hopping around these parts way too long. Over the years, Daly has lent his towering vocals to just about every high-profile hard rock act (including Damn the Torpedoes, Big Brother, Kingpin, Rocky Ruckman et frickin' cetera) in every beach hole-in-wall with a keg tap. His own project is just the sort of retro-edged hard finesse(Boston,Journey,name it claim it) that keeps popping up on the AOR stations around town. So while there's not much new ground broken, there's none intended. For you teetotalers who may have missed, Daly has some of Sammy Hagar's edge, with a lot of Steve Perry's emotion, though he can pull off the more laidback wares of Boz Scaggs at certain moments. This set contains a nice array of tunes( power ballads, epic rockers, ect.) with some chops-heavy playing. Features ZenDen impresario Steve Connelly on stun guitar(way to rawk out, brother man! ), guitarist Stephen Haendiges,bassist Willie Moore, drummer John Hartley, and late Riff Raff band bassist Sterling Lee Janacek on his final recording. Straight out of the gate JOHNNY'S QUEST II comes at you full speed ahead. If you're looking for blazing in your face metal it's not. Actually it's a fresh break from all the growling and screaming you hear these days. Most of the songs seem to have sort of a POPPY PSYCHEDELIC oriented guitar rock that keeps you coming back for a second and third listen. JOHNNY'S QUEST gets GGGG's for not following the mainstream and doing it his way as Daly plays most of the instruments and does all the vocals. intoning, "I'm gonna make you dance with me / You're gonna make romance with me." like a randy robot. He even takes a detour into goofy rap on Ghetto Stuck. Daly's Project is fun, filled with a sense of play and candidness. John Daly is a sturdy rocker that loves the gritty brand of riffage that plays well in bars and dive clubs. Most musicians would be happy playing covers and throwing his or her song once in a while, but John strives to be a little more than a local pub crawler. John is open to a massive variety of genres. 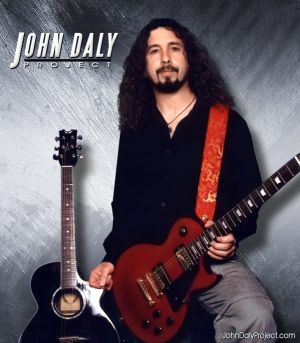 Outside of hard rock, classic swing, country and alt-rock clip have featured spaces in The John Daly Project. The songs are catchy, accessible and immediate.